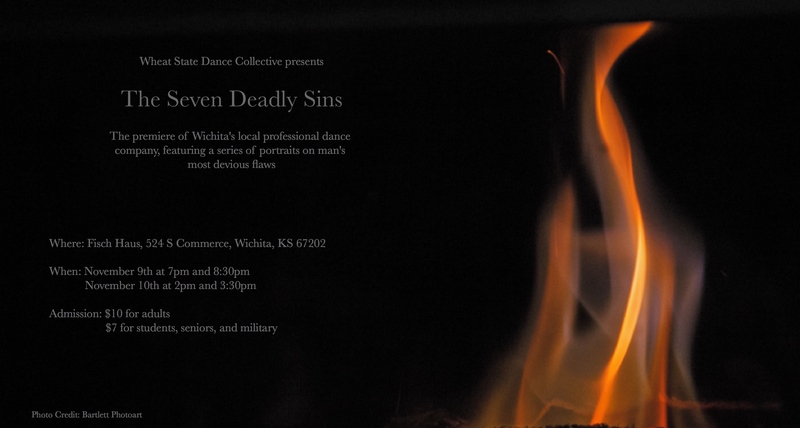 "The Seven Deadly Sins" is a series of dance solos, each one portraying the emotional and psychological aspects of these seven flaws of mankind. A dark, exploratory, and exciting performance of dance that depicts how sins expand from within, thoroughly engulfing and absorbing the human psyche. This performance aims to highlight the deep creativity of Wichita’s dance scene, and will run less than an hour: an ideal way to experience a fresh artistic perspective. Wheat State Dance Collective seeks to enhance and refine the already reputable quality of classical and contemporary dance by creating engaging, challenging, and thoughtful dance performances featuring locally-trained dancers from the city of Wichita and throughout Kansas. The company provides professional performance opportunities to locally-trained dance artists, and encourages those artists to stay and cultivate Wichita’s dance community, while still pursuing their dreams and further opportunities across the United States.